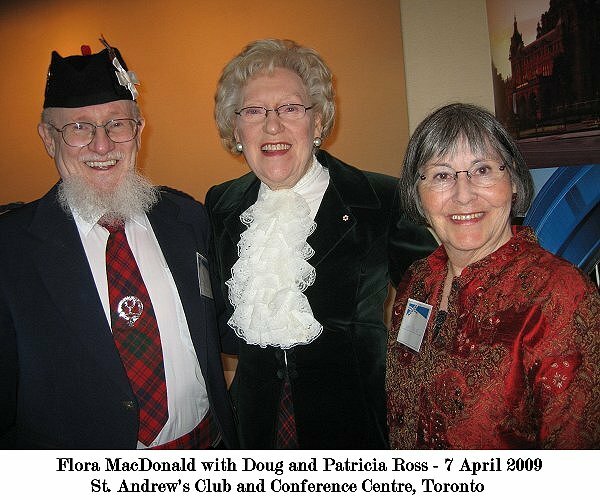 Flora MacDonald, June 3, 1926 - July 26, 2015, was born in North Sydney, Nova Scotia. She was MP for Kingston and the Islands for 16 years, through five elections, from 1972 to 1988, and served in three cabinet positions . . . Canada's first female foreign minister as secretary of state for external affairs, minister of employment and immigration and minister of communications.. She publicly opposed the Progressive Conservative decision to merge their party with the western Canadian Alliance fringe group in 2003. 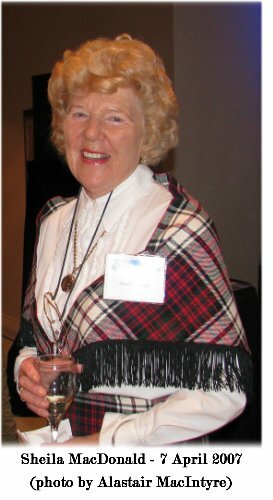 The website of the Scottish Studies Foundation notified everyone that the 2009 recipient of the Scot-of-the-Year Award would be Flora MacDonald, and I immediately sent an email to David Hunter that I'd be truly looking forward to the presentation of the award to Flora MacDonald. I told him that I was introduced to her in a reception line during the mid-1970's at a Kiwanis luncheon at Casa Loma a couple of years after her successful election as an MP. I said one word - - - "Flora". She looked at my tartan tie & clan badge and said, "Ross"! I'm not generally associated with PC agendas, but when Flora competed later in the leadership race I recall thinking that she would make a splendid Prime Minister. I added that I'd be wearing my kilt - - - and a white cockade in my cap. The photo below, with me and my wife, was taken by her sister Sheila MacDonald (See left) on the occasion of her acceptance of the Scot-Of-The-Year Award presented by the Scottish Studies Foundation in 2009. Flora said that her outfit in the picture was copied from a painting of her Scottish namesake during the times of Bonnie Prince Charlie. She was an Officer of the Order of Canada, a Companion of the Order of Canada, and a member of the Order of Ontario. She received the Jordanian El Kawkab Medal by King Hussein for significant contribution to public service; the Pearson Peace Medal; the Churchill Society's award for Excellence in the Cause of Parliamentary Democracy; and was the first Canadian to receive the Padma Shri Award (India's highest award to civilians) from the President of India for distinguished service in the field of public affairs. Flora also holds honorary degrees from universities in Canada, the United States and United Kingdom.